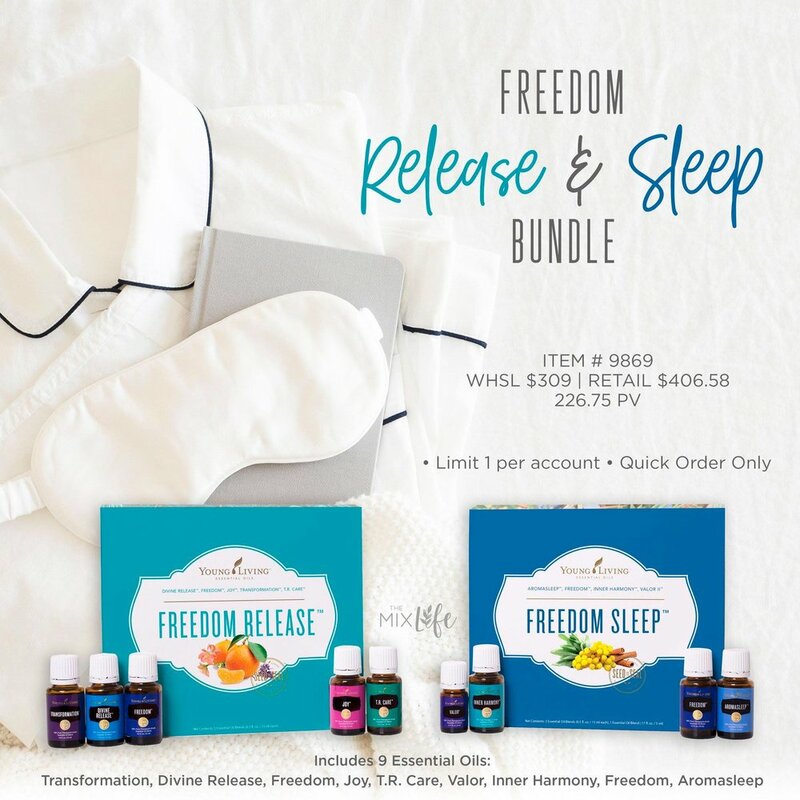 The elusive Freedom Sleep + Freedom Release collection came and went like a thief in the night! And of course, thatâ€™s how it happened because we were SOUNDLY RESTING IN DREAM LAND WITH THIS AMAZING KIT! ðŸ˜´ FREEDOM SLEEP COLLECTION- This collection was created to help re-establish a positive energy flow throughout the body, helping to relax and calm oneâ€™s thoughts and feelings prior to bedtime. With improved relaxation, the body and mind are rejuvenated, bolstering oneâ€™s ability to overcome lifeâ€˜s challenges and reach oneâ€™s highest potential. This collection contains four blends, designed to be used twice a day in a 30-day protocol (followed by a second 30 day protocol with the Freedom Release Collection). ðŸ’§15mL Freedom: This unique blend is specially formulated to help quiet the mind and allow it to release past emotional traumas, giving one the freedom to strive for their highest potential. -This blend contains: Copaiba, Sacred Frankincense, Idaho Blue Spruce, Vetiver, Lavender, Peppermint, Palo Santo, Valerian & Rue. (Yes, this is identical to the Freedom blend re-released at 2018 Convention). ðŸ’§15mL AromaSleep: This unique blend is specially formulated to help quiet the mind and allow it to release feelings of stress and giving one the freedom to achieve restful, productive sleep. ðŸ’§15 mL Inner Harmony: This unique blend is specially formulated to help bring balance to the mind, spirit, and emotions, allowing one to release past trauma and become grounded in the present time. ðŸ’§5mL Valor: This blend has been used to help empower the physical and spiritual bodies. It helps us overcome fear and opposition so we can stand tall during adversity. It may help build courage, confidence, and self-esteem. It brings a feeling of calmness, peace, and relaxation. ðŸŒŸFREEDOM RELEASE COLLECTION- This collection was created to bring a sense of balance and harmony. It helps to release feelings of anger and promotes forgiveness, elevating the mind and bringing out the gentle characteristics within oneself for a positive outlook on life. This collection contains five blends, also designed to be used twice a day in a 30-day protocol. ðŸ’§15mL Divine Release: This blend contains oils known for their abilities to help release past emotional blocks and to help alleviate feelings of anxiety, stress, fear, and emotional trauma. ðŸ’§15mL Transformation: Many of the oils in this blend are powerfully energizing and stimulating to the conscious mind, allowing for the support necessary to make changes, especially mental and emotional changes. ðŸ’§15mL T.R. Care: This blend contains oils known for their abilities to help calm and soothe nervous tension and to help alleviate fears and emotional trauma. A restful nightâ€™s sleep is the foundation on which ALL emotional healing is based. This protocol is specific to these collections. The use of other essential oils, blends or supplements that help support rest may also be used.